We’re so glad you’re considering adopting from Anicira! If you’re ready to bring home a furry family member, we invite you to visit us each Saturday from 11am-3pm at either Petco or PetSmart. Please call us at 540-217-2512 to find out where we will be each weekend. 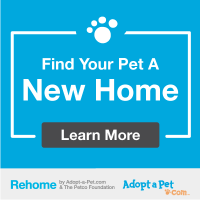 You can also find a complete list of our pets available for adoption here. You can submit an application directly through our Available Dogs page. After your application has been submitted we will be in contact with you within one business day. If you are interested in a particular dog, just let us know which one and we can arrange a meet and greet at one of our adoption events each Saturday. All cats and dogs residing at the residence must be spayed/neutered. We do not adopt dogs to outdoor-only homes. All adults in the home must be in agreement before adopting. All cats and dogs must be up to date on core vaccinations. Our commitment does not end at adoption. If you have any questions or concerns years down the road, we will give you and your adopted companion ongoing support. Our adoption program runs on donations. Please consider donating directly to Anicira, or purchase something for our pets from our Amazon WishList.